Graze was started by seven friends sick of chips and candy, who wanted a better way to snack. They quit there jobs and camped out in a friend’s spare room for months and after a lot of hard work, graze.com was born - snacks that show off the tasty side of health and are delivered directly to you. Fast forward a few years and they have developed a range of over 90 delicious snacks and designed an intelligent algorithm, that they call darwin to customize each and every box specially for you. Graze boxes are 100% biodegradable & 100% recyclable and they make perfect punnet planters for a graze box herb garden. Graze gives you a sample of natural and tasty snacks for $6 per box, users can choose to receive boxes every two weeks or every four weeks. Shipping is free but currently Graze only ships within the lower 48 U.S. states. Users can rate the items in their boxes as "try", "like" or "love" to affect future boxes. In my first NibbleBox I received My Thai - sweet chilli sauce with baked soy bites, Walnut and Vanilla Truffle - fudge pieces, walnuts, raisins and vanilla pumpkin seeds, Apple and Cinnamon Flapjack - rustic rolled oat flapjack with apple and cinnamon, and Garden of England - mini strawberries, blackcurrants and apple. Everything was delicious and different, in a GREAT way! I love that everything is organic or vegan. My daughter's loved the Flapjacks and my fiance enjoyed the Walnut and Vanilla Truffle. Overall I thought this was a pretty amazing box, and I already ordered my second one!!! 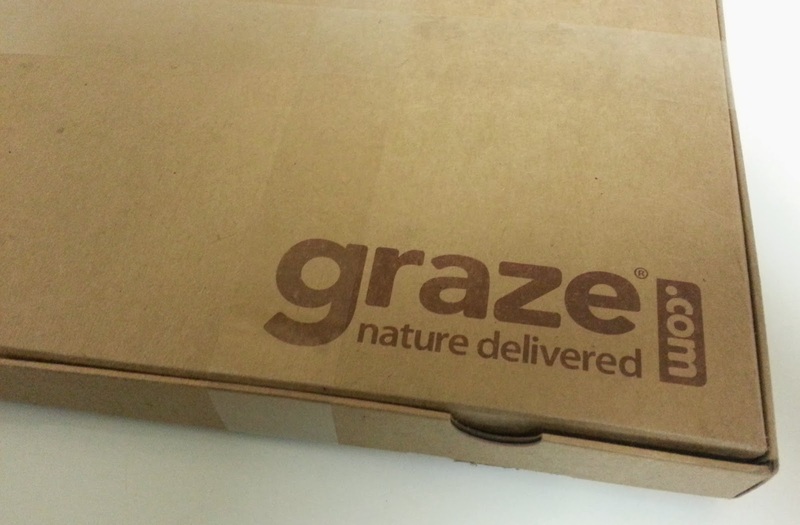 DISCLAIMER: All products received are complimentary for testing purposes from Graze. All opinions stated are my own and are not influenced by any affiliates. How neat! I know exactly how they felt! I get sick of the limited snack choices as well. I love the idea behind this! Such a great way to discover new snacks and treats! Plus, I really like that the boxes are recycleable.Great price, too! Wow, that's pretty cool. How innovative. These girls were thinking. They should be on Shark Tank. It's one of my favorite shows. That is a really good price too considering it includes shipping. That is impressive. Thanks for sharing! 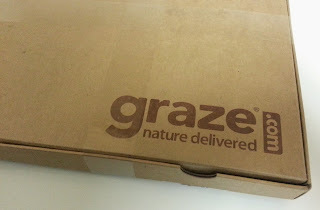 I totally agree, Graze is definitely an amazing company. I love the concept and the mix of snack foods. I've never seen anything like it. The flapjack, truffle and fruit and nuts would be my favs. Those were my favorites, everything was so yummy! 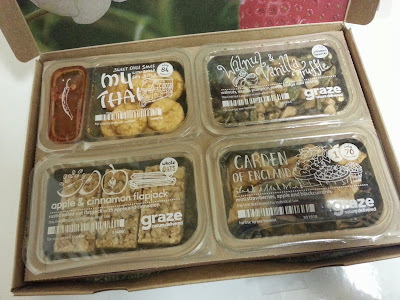 I had Graze boxes for a few months and I loved them. It's a great way to discover new snacks and gain ideas on what to put in your own lunchbox. What a great idea. I love it! Thanks for letting me know such a business exists. This is such a cool idea! I want to try this. I love the Graze boxes! I know the point of the box is to 'graze', but I'd like a full size for each sample! Ha ha. Definitely try it, I highly recommend it, plus with the price you just can't go wrong! This would be a nice change for snacks...thanks for sharing! This might be a great one to try when they expand to include allergy-safe options. I'd love to gift something like this to teachers. Very neat! I love that there are so many different home delivery sample box options these days. Something to fit everyone's personal tastes. I totally agree! The variety is amazing and if you don't like something you can always try something else! It's all YOUR choice! Yeah, it's pretty much perfect every way possible! My husband would love this. Hes a serious grazer..lol. Loves his snacks, and isnt known or making the healthiest of choices. How can you go wrong for that price? very cool. It is the PERFECT price, my fiance LOVES this company!!! It has healthy options and you can always try something over and over again! I am a terrible snacker- I prefer chips and sweets. But since I want to get healthier this year, I want better alternatives. It sounds like Graze is right up my alley! That looks really yummy! I'm going to check them out now! Great alternative to some of the junk currently in my home. It really is the perfect alternative!!! I get a monthly snack box from Nature Box that has 6 bags of snacks and they send gluten free ones. Is gluten free an option with that company? I love their square packaging and that you can get those more than once a month!